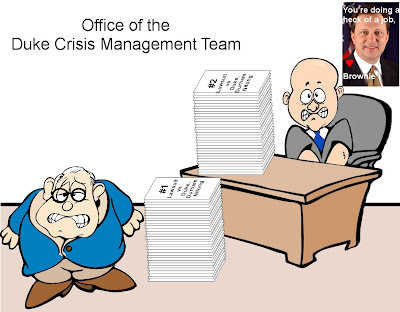 LieStoppers: "Dickie, you're doing a heck of a job"
"Dickie, you're doing a heck of a job"
Duke COB Steel directed President Brodhead to create a Crisis Management Team (“CMT”) to manage the University’s actions relating to the investigation of Mangum’s claims. So what was the final grade for their Management? How can the Duke Board of Trustees continue to let these incompetent administrators stay on the job? Steele must go. He was the wrong person to begin with and was the worst possible in the recent pr crisis at Duke. What is the big shock here? The families have every right to sue the city for negligence of an entire political system that failed miserably! This is by far NOT the biggest case to be media worthy, but one that has brought to the light of day a sample of what people in power do every single day and nobody even knows or cares! Well, I am here to tell the WORLD and every entity watching, that As God is my witness I will not go to my grave without speaking out about the same system that has not only covered over my beloved brother's murder, but have mocked us, threatened us, and continue to deny us the right to know not just how my brother died, but everything that was done and NOT done! I have contacted EVERY person their is imaginable, excluding the President, and still have been denied not just documents, but the right of a family to know how their loved one met their death, and to know what was done, and not done to his body! We have been lied to and threatened by the Durham Sheriff's Department, have been shuffled through 3 years and 3 District Attorneys, countless complaints filed to numerous governmental agencies, even our own Congressman Dennis Kucinich, and STILL NOTHING! We have sent our documents that we have been able to glean from the system to Mr Ekstrand, but due to his obligation to the LAX team is unable to represent us but would if he could! I have sent him, the FBI, and several others copies of the BLUE blood coming from an entrance wound, none from 2 exits wounds, a inconclusive and actually negative GSR screen, proof of fraud and collaborative deception, and have been to hell and back in this maddening chase to expose this city and system for allowing crimes against humanity to go unannounced, while innocent people suffer from the hands of the very powers who took oaths before God and man to protect and serve! So, here my family and I are coming forward to beg the media to help us to solve my brother's death, and expose a system of debauchery and evils that not only baffle the mind, but leaves you breathless and speechless! I have tried and done all that I can alone, and now have 2 months before the state can be held liable for not just one mans death, but expose a system that feeds off the helpless, then leaves them for dead! So, in closing I will say the purpose of this letter now on this thread is to also gain attention to the enumerable failures within the system, to right a countless injustice done to a plethora of lives that have been left completely devastated, and to make our government be held responsible and accountable for FAILING us the citizens, and the dead who have no voice but scream beyond their graves! The truth is worse than a nightmare because it is REAL and more HORRIFIC than you could ever have imagined! Never could I have guessed such wickedness by not just individuals, but extremely organized and calculated, and failed by the very country and leaders we so blindly put our hopes and faith into! My heart bleeds for the truth, and mourns those who have been so wickedly tortured! My brother and countless others did NOT die in vain, and I will be damned if I will let fear keep me from Justice For Jack, but JUSTICE For ALL! Imagine instead, your child or loved one MURDERED, and not only does it take Law Enforcement over a YEAR to send ONE single report, they LIE to you from the beginning, and not only REFUSE to do any investigating, but fail to adhere to ANY role of conduct and protocol, then threaten you and LAUGH at you?! Yes, I have the utmost sympathy for the team, but let us not forget just how many OTHER cases have been corrupted by the exact same system! WHAT has been done to answer and solve the murders of my brother, Janet Araboa, and Michelle Young?! What voices have they now they are dead?! Where is the outrage, and public and media attention for our families?! Nifong is by far the only knave on the long list of miscreant marauders who care nothing about rights of citizens, and care only for what is in "their" best interest! Wake up people and ask why the Department of Justice has not intervened, and why do our nations leaders just watch and do nothing about an abjectly corrupt and politically ran city?! I never would have imagined what I now know, and am sick that nobody has taken our pleas, and heard our cries! Our loved ones not just dead, but murdered, and we will never see them hear them, or feel their touch ever again! Unfair?! Unjust?! Impossible?! The cesspool of corruption flows deep into a murky quagmire of wickedness that should expose our own government for allowing it to continue! True and REAL crimes against humanity ranging from organized crime and drugs, to kidnapping, slavery, prostitution, and murders for global sale of body parts! Google human trafficking in organs, and learn exactly what is going on behind closed doors "the powers that be" never want to see opened! The reality is not only horrific and unimaginable, it IS happening every single day across the world, and Durham is just one of the many links in this chain of the grisly, dark underworld! I have fought for nearly 3 years to restore my beloved best friend's respect, and JUSTICE he, and all of the others desperately deserve, and will never quit until something is done and things are changed! NOBODY deserves what mine and countless other families have endured, and for us I am begging the people and media to make a difference and care about all of the other serious matters that have fallen to the wayside for needless years! Oh and about the DNA Lab and Meeham? where are they in this high powered filing? Guess you had to be there. Where IS the SBI report on my brother? Where is the details of what was done to his body and organs after he was killed? What was done to investigate his death? What was done to provide the family with documents and reports we should not just have public access to, but to every iota of information, as they closed his death as a "suicide" yet did no autopsy and lied they did? What was done to my brother is so horrifically twisted and unreal that the city has gone out of it's way to not only deny him an investigation, but to hide facts, alter reports, and fail to adhere to any semblance of protocol?! Where is the OUTRAGE for our family and others of unsolved and purposely neglected murders, just from 2005?! Does anybody out here give a damn for us?! Sister of Allen Jackson Croft Jr, murdered in Durham on May 11, 2005 fighting for JUSTICE! My name is Rhonda Fleming, and I am writing this letter and posting it on every news and blog site possible, to seek recognition, aid, and to educate the masses to the unfathomable abuses and crimes that are allowed to be continued without ANY help from our government concerning the murder of my brother in Durham, North Carolina in 2005, and many other crimes involving a very long list of injustices committed by Law Enforcement, and not just in the Carolina's. The media and world have focused too much attention to this one case, as countless other cases have been completely left at the wayside! During the three years I have spent gathering evidence that they have completely ignored, have made numerous official requests and complaints to countless officials in NC, and Washington DC, all to no avail. The focus is on one case by a city that is totally corrupt, yet the Department Of Justice, Administrative Office Of The Courts, Congress and many other official legislative, and judicial branches sits idly by, watches and does nothing! The lawsuit made by the Duke LAX team will shed a bit of light onto the deliberate attempt and conspiracy of many, to care less about the lives, laws, and rights of citizens, and instead use them and us as political pawns on their nefarious road to perdition. We have sent our documents that we have been able to glean from the system to Mr. Ekstrand, but due to his obligation to the LAX team is unable to represent us but would if he could. I have sent him, the FBI, and several others copies of the BLUE blood coming from an entrance wound, none from 2 exits wounds, a inconclusive and actually negative GSR screen, proof of fraud and collaborative deception, and have been to hell and back in this maddening chase to expose this city and system for allowing crimes against humanity to go unannounced, while innocent people suffer from the hands of the very powers who took oaths before God and man to protect and serve! Where is the outrage, and public and media attention for our families?! Nifong is by far the only knave on the long list of miscreant marauders who care nothing about rights of citizens, and care only for what is in "their" best interest! Wake up people and ask why the Department of Justice has not intervened, and why do our nations leaders just watch and do nothing about an abjectly corrupt and politically ran city?! I have fought for nearly 3 years to restore my beloved brother, and best friend's respect, and JUSTICE he, and all of the others desperately deserve, and will never quit until something is done and things are changed! NOBODY deserves what mine and countless other families have endured, and for us I am begging the people and media to make a difference and care about all of the other serious matters that have fallen to the wayside for needless years! Something MUST be done, and I have come forward to beg the media and government to hear what I have to say about my brother's case, and the crimes being done to many innocent victims that MUST be acknowledged, reported, investigated, and DESERVE action and resolution!